- Used for Security applications at different places. - Padlock labels as per international standards - duly made to suit / fit on Lockout Padlock. - 12 Nos. (01 Dozen) Labels supplied in each pack. 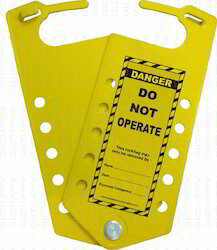 We supply all type of safety lockout/tagout items like; lockout HASP, circuit breaker lockout devices, Gate valve lockout devices, electrical lockout devices, cable lockout devices, safety lockout padlocks, labels and accessories, electrical plug chord, cylinder and pneumatic lockout, group lockout boxes, padlock and key stations as per OSHA's lockout/tagout standards. 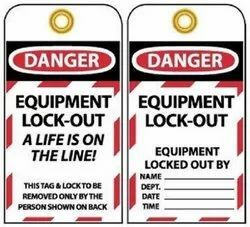 · Lockout Tags printed on 0.3/ 0.5mm Thick Plastic sheet. Made of Polyester/Plastic that is re-writable so can be re-used many times.